Reason 1 – Lake Tonawanda was in the Book of Mormon land Desolation. The ancient inland sea was near Bountiful, but did not form a shore of that land. The Onondaga Limestone Formation and escarpment parallels the linear divide or “line which was between the land Bountiful and the land Desolation.” (3 Nephi 3:23) Unlike the southern fortified “line” of Bountiful (Helaman 4:6-7), there is no mention of the “line” between Desolation and Bountiful being fortified in early Nephite times. (Alma 22:32) While there is mention of a “sea” north of “the line Bountiful and the land Desolation” (Lake Tonawanda, e.g. Mormon 3:8, Alma 50:34). The sea on the west of Bountiful is clearly the one named “the west sea”. The “narrow pass” passed through Desolation’s sea - “between the land northward and the land southward”. With the Batavia Moraine exposed as the “narrow pass which led by the sea into the land northward, yea, by the sea, on the west and on the east.” (Alma 50:34), the receded waters of Lake Tonawanda formed shorelines some distance north of the Onondaga Escarpment – in the land of Desolation. 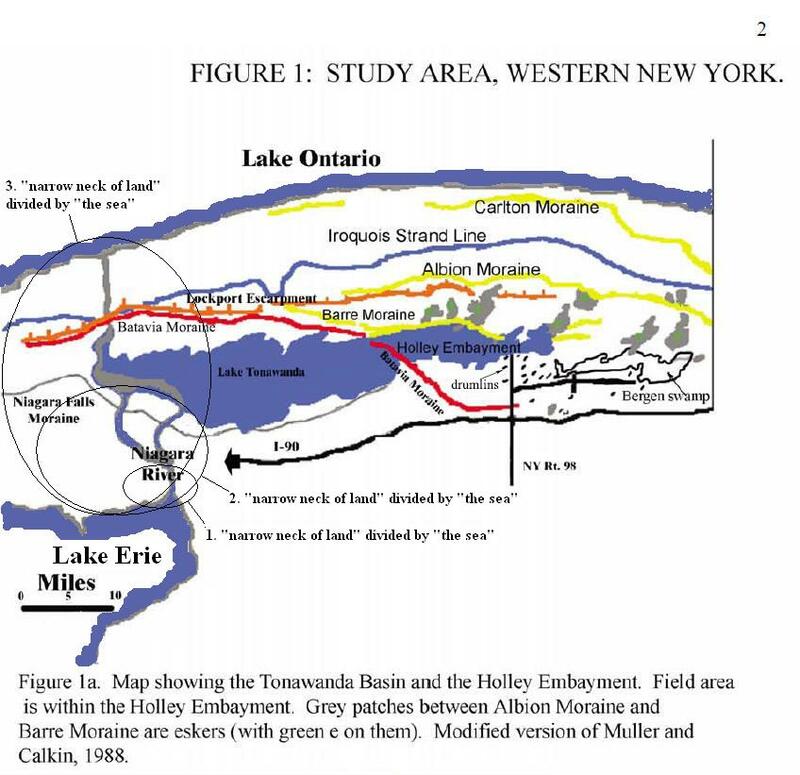 In fact, western Lake Tonawanda was bound north of the Niagara Falls Moraine (Figure 1.) which is north of the Onondaga Escarpment (the natural boundary between the land of Desolation and the land of Bountiful). The Onondaga Escarpment is a little north of, and approximately parallel to I-90. See Figure 1 above. Figure א. This map shows the authentic Book of Mormon setting featuring “the west sea” (Lake Erie), and the natural linear boundary between the lands of Desolation and Bountiful. Figure ב. The southern portion of the diagonal Batavia Moraine (tan) sits on the Onondaga Limestone Formation (light tan). From the Onondaga Formation, the Batavia Moraine extends northward, down into the land of Desolation and then runs parallel with, and within the divided Niagara Neck - as depicted in Figure 1. Tonawanda Creek is nearby, spilling over the escarpment at Indian Falls, just west of where the Batavia Moraine passed through the ancient inland sea. Natel: Figures 2, 3 and 5 depict the Batavia Moraine and Prehistoric Lake Tonawanda’s shoreline (undiminished) – north of the Onondaga Limestone Escarpment. Natel’s mollusk macrofossil study indicates that as Lake Tonawanda receded and the exposed Batavia Moraine cut off the eastern waters of the lake from the more effluent western side, different aquatic species came to inhabit the more stagnant eastern end. (E.g. pg. 72, Figure 23.) This is proof positive that in later stages of the lake, there really and truly was a narrow land-bridge that cut through the inland sea. This shouldn't be too surprising. Early 19th century maps of western NY show that the moraine was used as a pass through the muck-lands. Reason 2 – Even though Lake Tonawanda was connected to Lake Erie, it is unlikely that Lake Tonawanda (north of Zarahemla) would have been called “the west sea”. Given the scriptural location of the Book of Mormon land Cumorah (LDS Doctrine and Covenants 128:20), Lake Erie matches the Book of Mormon “west sea” splendidly. The Great Lake’s extent meets the requirements of scripture. Why should we suppose that “the narrow pass” and “the narrow neck of land” are different things? Scripture tells us that in the vicinity of “the narrow neck of land” there is a “place where the sea divides the land”. (Ether 10:20) Thus, “the narrow neck” most likely has something to do with the conspicuous Niagara Isthmus. The Great Lake clearly “divides the land” at the place where Lake Erie becomes the Niagara River! See Figure 1a. and Figure א. With Buffalo River close by to the south, this is an ideal location for a “great city” - in fact, there is one there today! Unlike “the narrow pass”, there is no indication in scripture that “the narrow neck” was a continuous, unbroken land bridge that “led into the land southward”. (Mormon 2:29; 3:5) West of the Niagara River divide, “the narrow neck ... led into the land northward.” It was “by the narrow neck”, not “the narrow pass”, that Hagoth launched his “exceedingly large ship … into the west sea”. (Alma 63:5) The mouth of Buffalo River can accommodate very large ships. It is an ideal location for a Nephite, Sidon-like seaport. There are two battleships and a submarine moored there today. Check it out on Google Earth! From “the heart of their lands”, the names “east sea” and “west sea” make sense. Similarly “east sea” (the Salt Sea, Ezekiel 47:18, Joel 2:20, Numbers 34:2-3) and “utmost sea” (the Mediterranean, Deuteronomy 34:2. Joel 2:20) are appropriately named relative to Jerusalem. The Hebrew words, “ha-yam ha-aharon” translated “the utmost sea” in the KJV, actually indicates “the western sea” - west with respect to Jerusalem and the land of Israel in general. The fact that the ancient inland sea is identified today by the name - “Lake Tonawanda”, not Prehistoric Lake Erie, should prompt us to consider that even though the lake was connected to Lake Erie (via the Niagara River), it most likely would have been given its own name in former times. Names like north sea or Desolation sea would have been appropriate, and consistent with how neighboring bodies of water were named relative to the Nephite “center of the land”. Besides, it’s difficult to say exactly how diminished Lake Tonawanda was by Nephite times - that is, how connected it was to Lake Erie near its shallow eastern end. Tonawanda River (near “the narrow pass”) could have been a more significant contributor to the Lake. The Nephites certainly would have had means of fording Tonawanda River to get to “the narrow pass”. Today there is a small bridge spanning the creek in the town of Batavia. It makes sense that the Nephites would have distinguished Lake Tonawanda with some name other than “the west sea” in order to avoid ambiguity with Great Lake Erie that formed the long, western coast of their principal lands? Indeed, the simplest, most straightforward interpretation of scripture supports the conclusion that “the west sea”, on the western coast of Nephi and Zarahemla, is the same “west sea” that forms the western coast of the land Bountiful just to the “north”. This great body of water is consistently named “the west sea” throughout the Book of Mormon. The land Bountiful “north” of the Nephite “center of the land”, plainly shares Lake Erie’s coast with Zarahemla and Nephi. What about the expression “west sea, south”, that occurs once in scripture? Does this expression represent a different or more specialized name for Lake Erie - distinguishing it from Lake Tonawanda? In other words, can the expression “on the west sea, south” be construed to suggest that Lake Tonawanda was called “the west sea” or the west sea, north? (Alma 53:8) No! The same Book of Mormon chapter restates the meaning of the expression “…on the west sea, south”. The Book of Mormon explains that the expression simply means, “on the south by the west sea.” (Alma 53:22) Nothing more is suggested! The translated name of the sea is “the west sea”. The name, or proper noun “west sea” has the construct “west” (adjective) + “sea” (noun), whereas “sea west” or “sea south” is a noun followed by a direction. (E.g. Helaman 3:8) Note that the expression “west sea, south” is a proper noun followed by a direction. The Book of Mormon expression “sea west” is just another way of saying “sea … on the west”. (Alma 22:27) Similarly, the expression “west sea, south” is just a way of referring to a southern coast of “the west sea”. The Book of Mormon name of the body of water, we now call Lake Erie, is “the west sea” . What of the “east sea”? From the King James Translation alone, the attentive Bible reader can tell that ancient Israelites referred to lakes as seas. The word lake is found nowhere in the KJV Old Testament. Even relatively small, inland bodies of water were called seas. Similarly, there are many inland seas (lakes) east of Lake Erie. In ancient times especially, the Finger Lakes region was truly “a land of many waters, rivers, and fountains” - more difficult for an invading force to penetrate. (Mormon 6:4) War parties would have been much preferred a continuous passable land route, to carrying canoes across a region covered by rivers and inland seas. The Tonawanda Creek corridor running parallel to the Clarendon Linden Fault is somewhat analogues to the Jordan Rift Valley of the biblical Promised Land. But unlike the Jordan, Tonawanda Creek flows northward. Long ago there was an inland sea or lake at the head of Tonawanda Creek in the Beaver Meadow, Gallagher Swamp, and Java Lake region. 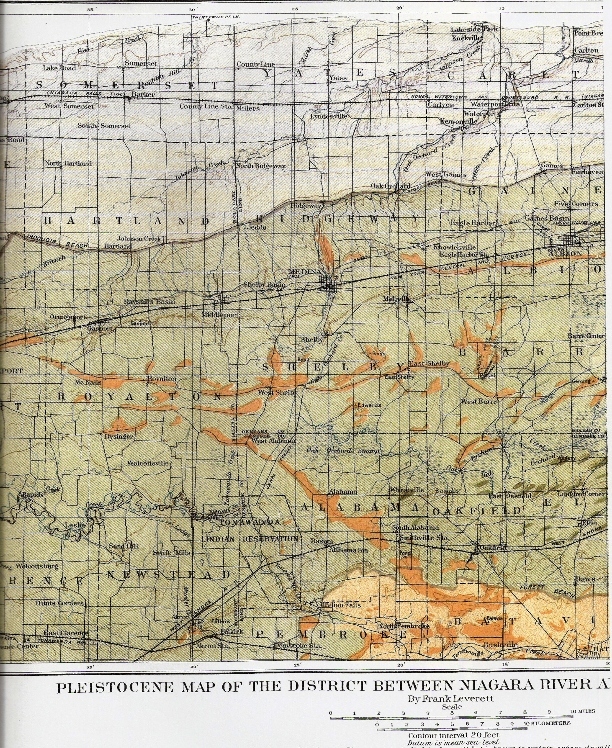 (Leverett, Glacial Formations and Drainage Features of the Erie and Ohio Basins, pp. 210-213) This lake also fed the narrow Cattaraugus Creek corridor which runs westward to Lake Erie. Here we have possible candidates for “east” inland seas in the authentic Book of Mormon setting. But which of these best fits the one the Book of Mormon calls “the east sea”? Of the interconnected eastern seas referred to in the Bible, one was actually called “the east sea”. The renowned inland sea is east with respect to Jerusalem. More commonly called “the salt sea” (or Dead Sea by Gentiles), this famous lake situates in the southeastern quarter of the land. (Numbers 34:3, Joel 2:20) Was the Book of Mormon “east sea” also located in the southeastern quarter of Nephite territory? There was a wilderness corridor between the Book of Mormon “east sea” and “the west sea”. Thus, “to the west” definitely means to “the west [sea]” in Alma 50:8. The “sea” (or lake) by the eastern borders of the land Bountiful is never actually called the east sea. (Alma 27:22) The Book of Mormon seems to deliberately avoid naming the eastern terminus of Bountiful “the east sea”, even when “the west sea” is mentioned first as the western terminus, that is, in reverse order from Alma 22:32-33. See Helaman 4:6-7 - curious! It may be significant that the word “east” in Alma 22:32-33 is not capitalized in the Book of Mormon Printer’s Manuscript. The printer or typesetter apparently interpreted that “east” meant “East [sea]”, and chose an uppercase “E” in the 1830 edition; imposing the idea that the East Sea bordered Bountiful. Fortunately more recent edition have restored the lowercase. There could have been other interconnected lakes and beaches north of “the east sea” and closer to Bountiful. The fact that there was a “sea” near the eastern borders of Bountiful does not prove it was the one called “the east sea”. So where exactly was the authentic “east sea” of the Book of Mormon’? I favor the long ago lake in the Beaver Meadow, Gallagher Swamp region, in the hill country of western NY. Matching scripture, this elevated lake was just east of the headwaters of Buffalo River (the Book of Mormon river Sidon, Alma 56:25; 50:8-14). The fortified city of Mulek (by the east sea, south, and technically in the land of Nephi, Alma 53:6) is listed after the city of Gid following a series of conquests from the south. (Alma 51:26) How can that be? Mulek is clearly listed after Gid coming from Bountiful! (Helaman 5:14-16) The simple answer is that “the east sea” was just a lake. Whether you got to Gid coming from the south, or from the north, you could reach Mulek by traveling south on the other side of the lake. The city of Nephihah was on the eastern side of the “head of Sidon” (headwaters of Buffalo River) across from the land of Manti. (Alma 56:25; 59:5-6) Therefore the “east sea” had to have been near the headwaters of Buffalo Creek/River (as is the Gallagher Swamp region). Did an ancient tributary of Sidon once flow from “the east sea”? So how big of a lake would the “the east sea” have needed to be in order to accommodate a series of seven fortified villages (what the Bible calls “fenced cities”; 2 Kings 18:13, 2 Chronicles 17:2) along its coast? To estimate an answer we need to know how big an Israelite fenced city was with its surrounding suburb? The Torah gives us an idea: From Numbers 35:4-5 we may generously assume 2000 cubits (about 17.5 inches/cubit) to be the distance along one side of a palisade city, having a suburb perimeter extending 1000 cubits beyond any wall. The entire distance across a Nephite city, including its suburbs end-to-end, therefore amounts to only (4000 cubits)(17.5 inches/cubit)(1 ft/12 inches)/(5,280 ft/mile) ≈ 1.1 miles. All seven Nephite fortified towns could have hugged the shore of a lake that was less than 8 miles long - about the size of one of the smaller Finger Lakes. This means that from Gid you could walk (or march) perhaps less than 10 miles to Mulek (stationed southward in the land of Nephi). It should be clear to students of the Book of Mormon that the distance between Bountiful in the north, and Mulek (land of Nephi border) in the south is not very great - less than a night’s or a day’s march. (Alma 52:18-28) Exaggerated geography promoters (including Heartlanders) - what are you thinking? 22 And now when Coriantumr saw that he was in possession of the city of Zarahemla, and saw that the Nephites had fled before them, and were slain, and were taken, and were cast into prison, and that he had obtained the possession of the strongest hold in all the land, his heart took courage insomuch that he was about to go forth against all the land. 23 And now he did not tarry in the land of Zarahemla, but he did march forth with a large army, even towards the city of Bountiful; for it was his determination to go forth and cut his way through with the sword, that he might obtain the north parts of the land. 24 And, supposing that their greatest strength was in the center of the land, therefore he did march forth, giving them no time to assemble themselves together save it were in small bodies; and in this manner they did fall upon them and cut them down to the earth. 25 But behold, this march of Coriantumr through the center of the land gave Moronihah great advantage over them, notwithstanding the greatness of the number of the Nephites who were slain. 26 For behold, Moronihah had supposed that the Lamanites durst not come into the center of the land, but that they would attack the cities round about in the borders as they had hitherto done; therefore Moronihah had caused that their strong armies should maintain those parts round about by the borders. 27 But behold, the Lamanites were not frightened according to his desire, but they had come into the center of the land, and had taken the capital city which was the city of Zarahemla, and were marching through the most capital parts of the land, slaying the people with a great slaughter, both men, women, and children, taking possession of many cities and of many strongholds. 28 But when Moronihah had discovered this, he immediately sent forth Lehi with an army round about to head them before they should come to the land Bountiful. 29 And thus he did; and he did head them before they came to the land Bountiful, and gave unto them battle, insomuch that they began to retreat back towards the land Zarahemla. 30 And it came to pass that Moronihah did head them in their retreat, and did give unto them battle, insomuch that it became an exceedingly bloody battle; yea, many were slain, and among the number who were slain Coriantumr was also found. 21 But Gidgiddoni saith unto them: The Lord forbid; for if we should go up against them the Lord would deliver us into their hands; therefore we will prepare ourselves in the center of our lands, and we will gather all our armies together, and we will not go against them, but we will wait till they shall come against us; therefore as the Lord liveth, if we do this he will deliver them into our hands. 32 And now, it was only the distance of a day and a half's journey for a Nephite, on the line Bountiful and the land Desolation, from the east to the west sea; and thus the land of Nephi and the land of Zarahemla were nearly surrounded by water, there being a small neck of land between the land northward and the land southward. 11 And thus he cut off all the strongholds of the Lamanites in the east wilderness, yea, and also on the west, fortifying the line between the Nephites and the Lamanites, between the land of Zarahemla and the land of Nephi, from the west sea, running by the head of the river Sidon—the Nephites possessing all the land northward, yea, even all the land which was northward of the land Bountiful, according to their pleasure. 12 Now, the king (Ammoron) had departed out of the land of Zarahemla, and had made known unto the queen concerning the death of his brother, and had gathered together a large number of men, and had marched forth against the Nephites on the borders by the west sea. 5 And in the fifty and seventh year they did come down against the Nephites to battle, and they did commence the work of death; yea, insomuch that in the fifty and eighth year of the reign of the judges they succeeded in obtaining possession of the land of Zarahemla; yea, and also all the lands, even unto the land which was near the land Bountiful. Connects both “land northward” and “land southward”. By an unnamed body of water referred to as a “sea”. Waters of the unnamed “sea, on the west and on the east” of it. Small enough in width to be described as a geographic “point”.